Over the last year I’ve had many conversations about the role ed tech incubators and accelerators play in stimulating disruptive change in higher education. Today I read an article written by Andy Thomason about colleges creating their own in-house ed tech incubators. Thomason positions the dialogue between the ed-tech startups and universities as a “two-way conversation.” Startups gain access to the rich intellectual capital cultivated at universities and colleges. Institutions gain perspective on what’s in the works for the future of higher education. The first question universities and colleges must ask is should the investment be in an incubator or accelerator? Often the definition is blurred and the terms are used interchangeably. At a high level, here’s the difference. 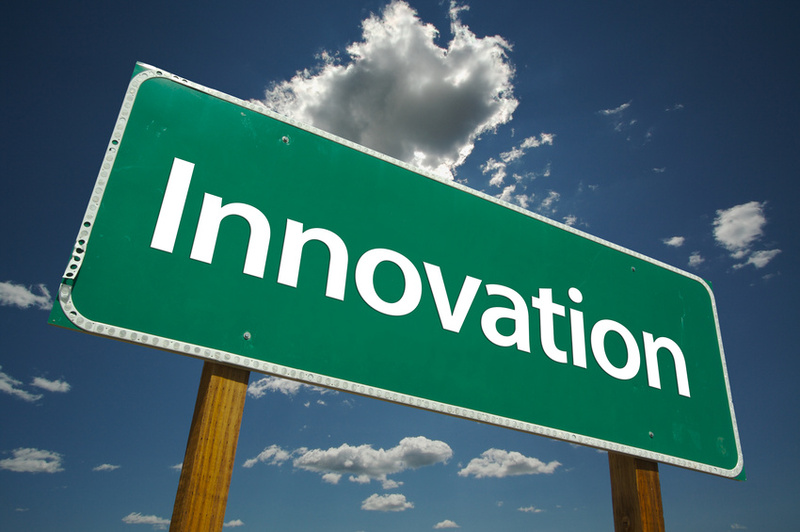 An incubator fosters a supportive environment to develop ideas, test solutions and examine business model options. Time spent in an incubator is usually less definitive than an accelerator. There may be other start-ups in an incubator that form a cohort, a supportive community of peers. Accelerators focus on nurturing startup success as well, however, the approach may include access to bundled professional services (business model development, branding, PR, product design), seed capital, support for launch and is bound by a time frame requirement. Often accelerators are defined as early stage investments and more questions are focused on ROI. Contributes to or leads the path forward to a long-term viable model for the future of higher education — basically taking an active role in disruptive change in higher education. What are the pros/cons for my institution to support an incubator vs. accelerator? What support needs to be in place to operate an accelerator that is time specific, mentorship-driven with critical resources to drive rapid progress on product solutions? What type of funding model makes sense? What is the governance model for establishing selection and success criteria and providing oversight for the start-up? What does a beta incubator/accelerator look like? Does it make sense to establish a cohort environment supporting multiple start-ups? What is the criteria for selecting a start-up for an in-house incubator/accelerator? Interested in assessing the possibilities of an in-house incubator/accelerator? Contact me at [email protected]. This post is part of an occasional career focused blog series for aspiring Higher Education CIOs or sitting CIOs. Previous posts can be accessed here. Yesterday I read a great blog post by Dr. James Michael Nolan, President of Southwestern College. He makes a case for the importance of social media in the business of higher education. Social media is in large part how students engage in and develop relationships. Prospective students use social media to research and select where they will ultimately attend undergraduate or graduate school. Dr. Nolan states that student recruitment efforts rely heavily on social media as a marketing (and dare I say sales) platform because it’s where students hang out. Social media is how institutions build relationships with prospective students. For career strategy, I believe that social media is an important tool for building a personal brand. If you are a sitting higher education CIO or an aspiring CIO, it is critical to consider how you are perceived in the broader IT community. What expertise are you known for amonst your peers? What attributes do you want your personal brand to represent? Moving up the IT career ladder requires an investment in building relationships across the broader IT community. Social media is the new model for establishing relationships locally and globally with other IT professionals, faculty, staff, student and higher education service providers — from your desk. Dr. Nolan correctly states, “…relationships no longer begin with a handshake — they begin with a Retweet, a Like, a Share, a Subscribe, a Comment, an interchange in social media.” Whether you are sharing your opinion in LinkedIn Groups with like-minded peers, or tweeting articles that catch your attention- social media provides a ready platform to launch your personal brand as a leader in higher education. There are many savvy higher education CIOs that have established a presence on social media; in essence building their personal brand. The key is to provide useful information about your area of expertise/interest through the lens of your own unique personality. Take small steps in delving into social media. Start by reviewing (or building) your LinkedIn profile. Ensure the content is well written and represents your accomplishments professionally. Conduct a search for a few groups to join. Take time to read posts and comments to provide a sense as to how individuals participate. Sign up for a Twitter account and begin following a few individuals and organizations that interest you. 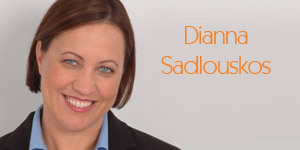 How do you think your personal brand is perceived by others? What do you want my personal brand to reflect? Academic Technology guru? 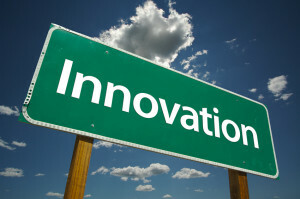 Innovative solution provider? Higher Education IT Visionary? What steps do you need to take to ramp up to your desired profile? 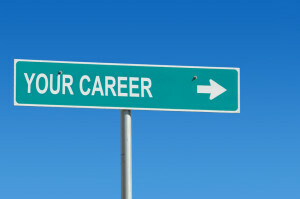 Interested in feedback on your career planning efforts or professional portfolio? Contact me at [email protected]. Are you a mid-level IT manager interested in preparing for the next step up in your career path? If this is the case, take some time to evaluate your skills and experiences against essential skills institutions look for in a CIO. The Center for Higher Education Chief Information Officers Studies, Inc. (CHECS), in their 2013 study of higher education chief information officers cite leadership, communication, technical knowledge, interpersonal skills and higher education knowledge as vital skills. If you find there are a few gaps in your background, here are 4 actions you can take to begin to develop attributes that are fundamental to the CIO role. Establish a mentor relationship. It doesn’t need to be an on-campus relationship; an executive coach or professional colleague will do. The goal is to gain valuable insight and guidance to begin positioning yourself for a leadership role. Reach out to someone whose career path you admire. Ask questions, run ideas by them, and learn from their experiences. Engage in the IT professional community. Use social media to build up your business networking profile. Participate in groups on LinkedIn. Volunteer to speak at conferences or join constituent groups. Having a strong network of colleagues will be very useful throughout your career. The goal of this action is advance your communication skills and position you as a leader in the IT professional community. Form alliances in student services or other administrative units. Take time to understand current business issues across campus. When possible, volunteer to lead or participate in cross-campus committees. Reach out to your customer base– understand their business concerns and spend time studying your campus from a strategic perspective. Have vision. Develop opinions about how technology will transform the business of higher education. Keep updated about current trends and controversies that fuel debates in the higher education community. What keeps the President/Provost up at night? What are your opinions about these issues and opportunities? 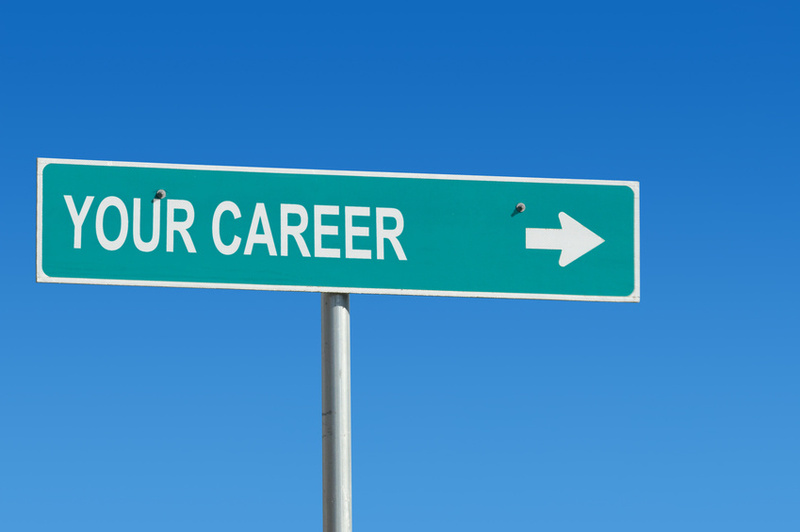 Interested in receiving feedback on your approach to landing your next career opportunity? Contact me at [email protected]. 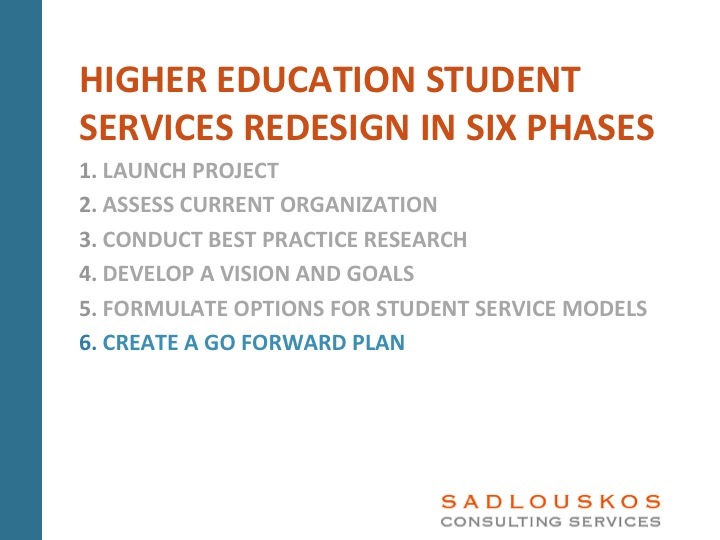 “Create a go forward Plan” is the seventh in a blog series that provides a high-level process roadmap for structuring a student services redesign initiative. This process can be applied in all higher education institutions for entire student services organizations or individual departments. To review this blog series from the beginning, click here. In Phase 6, the goal is to create an implementation plan that is concrete and actionable. A key success factor for executing a student services redesign initiative is to assign an owner to lead implementation. Oversight of the implementation plan should be formalized with performance metrics incorporated into the annual performance review process. Without formalizing this role the student services redesign initiative is at risk for being less of a priority than other day-to-day responsibilities. If the redesign initiative spans multiple service lines in student services, additional team members may need to be assigned. Identify if work streams require full-time, part-time or ad hoc team members and plan resourcing accordingly. The go forward plan includes 2 components: a communication strategy and an implementation plan. Does it make sense to appoint the project leader who managed the student services redesign planning effort to implement the plan? How are change management activities accounted for in the go forward plan? In communication planning, how will the implementation team gather ongoing faculty, staff and student feedback about the redesign effort? 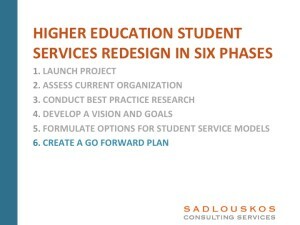 Interested in receiving a white paper focused on this student services redesign blog series? Contact me at [email protected].